Can a Thin Brain Cut You Off From the World? Does This Explain the Culture War's Heat? Are Other Planets Like Earth Out There? Is Neuroscience the Next Culture War Front? Do Kids Have Different Virtual Morals? Is Belief in God a "Buffer" Against Anxiety? Did Morality Evolve From Innate Aversions? 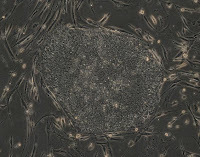 Doctors in Canada and Scotland report that they've found a new way to use skin cells to create stem cells that seem to have the same potential as embryonic stem cells—namely, the ability to become nearly any tissue in the body. It's a promising breakthrough both scientifically and ethically: Using skin cells as the starting point bypasses the moral debate surrounding the creation and destruction of embryos.